The drug is manufactured in 100 ml and 1 l polymeric bottles. Combined action of two antibiotics from different groups reduces the likehood of resistant pathogenic microorganism appearance. 1 ml of Hentaflox solution for oral use contains enrofloxacin - 100 mg and gentamicin sulfate-50 mg (as active ingredients), as well as excipients. 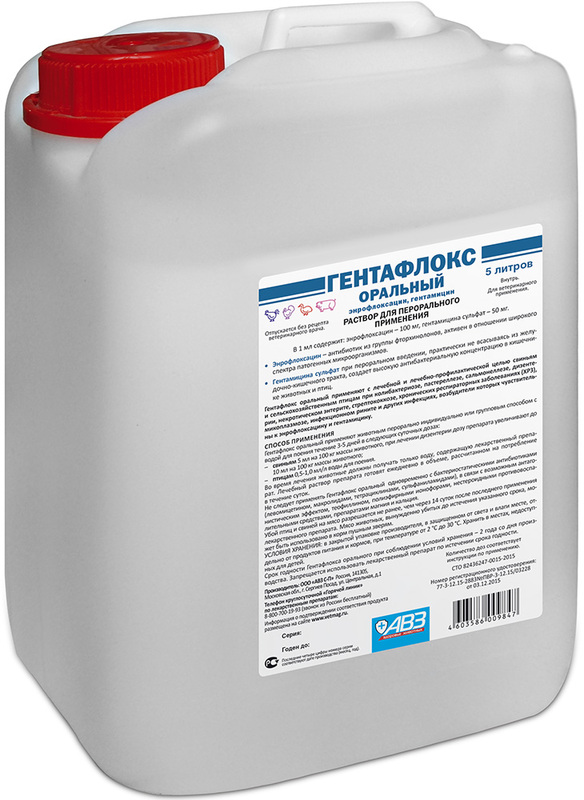 Hentaflox solution for oral use is a combined antibacterial drug. Enrofloxacin (an antibacterial fluroquinolone drug) is active against most of gram-positive and gram-negative bacteria, mycoplasmas and chlamydias. Mechanism of enrofloxacin antibacterial action involves bacterial DNA gyrase inhibition. After oral administration enrofloxacin easily absorbs in gastrointestinal tract, penetrates in blood and distributes within organs and tissues. It obtains peak serum concentration in 1.5-2 hours after use. Therapeutic concentration remains within 24 hours after oral administration. Enrofloxacin is partially metabolized in liver with further formation of active metabolite (ciprofloxacin). It is mainly excreted unchanged and partially as metabolites in urine and bile, as well as in milk of lactating females. Gentamicin sulfate (an aminoglycoside antibiotic) is active against most of gram-positive and gram-negative bacteria. Mechanism of gentamicin antibacterial action involves protein synthesis inhibition at ribosomal level of microbial cell. After oral administration gentamicin sulfate slightly absorbs within intact intestinal wall; gentamicin adsorption increases due to inflammatory process in damaged intestinal mucosa. Mainly, it is excreted unchanged in feces. Use Hentaflox solution for oral use to treat and prevent pigs and poultry with colibacillosis, pasteurellosis, salmonellosis, dysentery, necrotic enteritis, streptococcosis, chronic respiratory diseases (CRD), mycoplasmosis, infectious rhinitis and other infections, agents of which are susceptible to enrofloxacin and gentamicin. Increased individual sensitivity to the drug components. It is not allowed to use in laying hens and replacements due to drug accumulation in eggs. 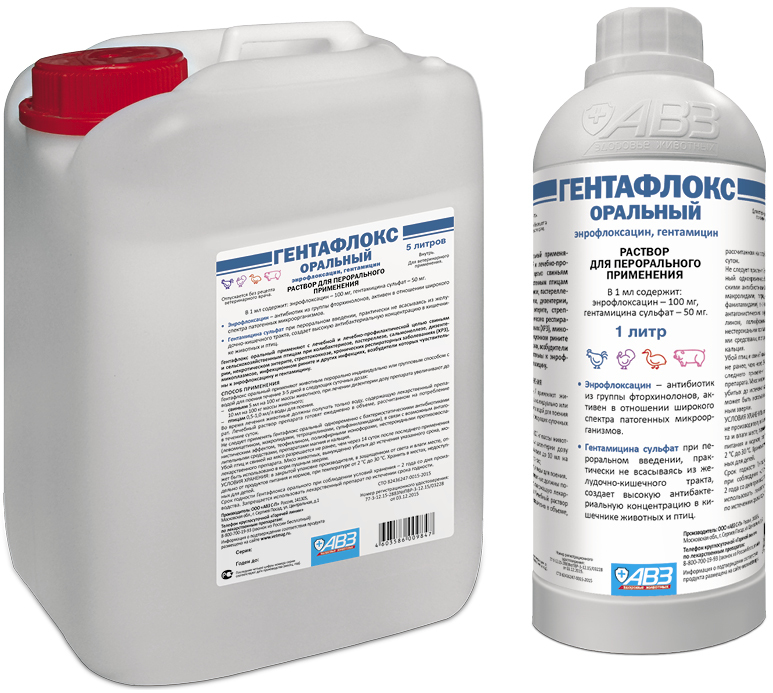 Do not use Hentaflox solution for oral use in combination with bacteriostatic antibiotics (levomycetin, macrolides, tetracyclines, sulfanilamides) due to potential antagonistic effect, theophyllin, polyether ionophores, nonsteroidal anti-inflammatory drugs, calcium and magnesium supplements. • poultry - 0.5-1.0 ml/l of drinking water. Overdose symptoms: excitement changed to sharp depression; high respiratory rate and heartbeat, potential nephrotoxic effects. In this case stop drug administration and use symptomatic drugs. Pigs and poultry are allowed to be slaughtered for meat not earlier than 14 days after the last drug administration. Meat of compulsorily slaughtered animals received before stated period termination can be used to feed fur animals. Store in closed original package. Protect from light and moisture. Keep out of the reach of children and animals. Store separately from food and animal feeding at 2-30°С.